MANAGUA, Jun 19 2014 (IPS) - More than 30,000 members of the Mayagna indigenous community are in danger of disappearing, along with the rainforest which is their home in Nicaragua, if the state fails to take immediate action to curb the destruction of the Bosawas Biosphere Reserve, the largest forest reserve in Central America and the third-largest in the world. Arisio Genaro, president of the Mayagna nation, travelled over 300 km from his community on the outskirts of the reserve in May to protest in Managua that the area where his people have lived for centuries is being invaded and destroyed by settlers from the country’s Pacific coastal and central regions. In early June, Genaro returned to the capital to participate in several academic activities aimed at raising awareness on the environment among university students in Managua and to protest to whoever would listen that their ancestral territory is being destroyed by farmers determined to expand the agricultural frontier by invading the protected area, which covers 21,000 sq km. The Mayagna chief told Tierramérica that in 1987 the nucleus of what is now the biosphere reserve had a total area of 1,170,210 hectares of virgin forest and an estimated population of fewer than 7,000 indigenous people. In 1997, when it was declared a Word Heritage Site and Biosphere Reserve by the United Nations Educational, Scientific and Cultural Organisation (UNESCO), the reserve covered more than two million hectares of tropical rainforest, including the buffer zone. By 2010, when the indigenous people living in the reserve numbered around 25,000, the jungle area had been reduced to 832,237 hectares, according to figures cited by Genaro. The presence of non-indigenous settlers within the borders of the reserve had climbed from an estimated 5,000 in 1990 to over 40,000 in 2013. “The y are burning everything, to plant crops. They cut down forests to raise cattle, they log the big trees to sell the wood, they shoot the animals and dry up riverbeds to put in roads,” Genaro told Tierramérica. Antonia Gámez, a 66-year-old Mayagna chief, also made the trek from her community to speak out in towns and cities along the Pacific coast about the situation faced by her people in Bosawas, whose name comes from the first syllables of the main geographical features that delimit the reserve: the Bocay river, the Salaya mountain, and the Waspuk river. Gámez said that in the forest, her people planted grains and grew and harvested fruit, and hunted what they needed for food with bows and arrows. She added that there were abundant crabs and fish in the rivers and wild boars, tapirs and deer in the forests. “Now the animals have gone. With each bang from a gun or mountain that is cleared, they either die or move deeper into the jungle. There aren’t many left to hunt,” she complained on her visit to Managua. Part of the reserve is also inhabited by Miskitos, the largest indigenous group in this Central American country, where by law native people have the right to collectively own and use the lands where they live. The complaints by the indigenous people were corroborated by Tierramérica in conversations with independent academics and activists as well as government officials. Anthropologist Esther Melba McLean with the Atlantic Coast Centre for Research and Development at the Bluefields Indian and Caribbean University has led studies that warn that if the invasion by outsiders and destruction of the forest are not brought to a halt, both the Mayagna people and the native flora and fauna of Bosawas could disappear in two decades. “The destruction of the forest would mean more than the end of an ethnic group; it would mean the end of the site where 10 percent of the world’s biodiversity is found,” she told Tierramérica. The reserve is home to endemic species like the Nototriton saslaya salamander and the crested eagle, which are listed as endangered by local environmental organisations that point out that there are still many species that have not even been documented. A study published in 2012 by the German development cooperation agency, GIZ, Nicaragua’s National Union of Agricultural and Livestock Producers (UNAG), the European Union and the international development organisation Oxfam warned that it would take 24 years to lose the forest in Bosawas and 13 years to lose the buffer zone around the reserve, at the current rate of deforestation. Incer told Tierramérica that in response to the indigenous community’s complaints and the backing they have received from environmentalists, the administration of President Daniel Ortega, who has governed since 2007, has begun to take measures against the destruction of the forest. “But they have been insufficient,” he acknowledged. Ortega ordered the creation of a military battalion of more than 700 troops to guard the country’s forests and nature reserves. The government also organised a committee of national authorities aimed at coordinating actions and applying a zero tolerance approach towards people and organisations accused of destroying the environment. Alberto Mercado, the technical coordinator of Bosawas in the Ministry of the Environment and Natural Resources, said at the Central American University in Managua on Jun. 10 that the government has been carrying out actions to curb the destruction of the reserve. He said the authorities had removed dozens of non-indigenous families from the nucleus of the reserve, and that they had brought people to trial who were dedicated to illegally selling land in Bosawas. Mercado said dozens of lawyers have been investigated and suspended for allowing sales transactions involving indigenous property. In addition, he said, the authorities have been combating trafficking in local fauna and flora. 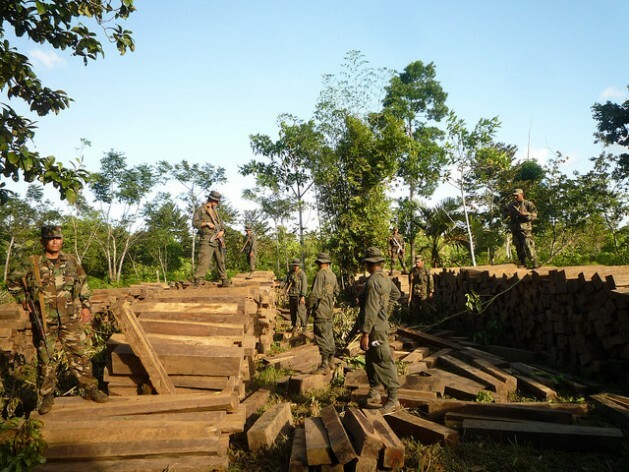 “But the struggle is huge…traffickers identify the ‘blind spots’ and that’s where they make their incursions into indigenous territory, fence it in, claim it is theirs, and that’s how the trafficking of land starts,” the official said, sounding discouraged. The complaints of the indigenous community have gone beyond national borders, and have reached international human rights organisations. The non-governmental Nicaraguan Human Rights Centre also filed a complaint with the Organisation of American States (OAS). Vilma Núñez, director of the Human Rights Centre, told Tierramérica that she had denounced the situation faced by the Mayagna people during the 44th OAS General Assembly, whose main theme was “development with social inclusion”, held Jun. 3-5 in Asunción, Paraguay. “The state and the government should guarantee the right of the Mayagna and all indigenous people in this country to live on their own land, and defend them from extermination,” Núñez said.